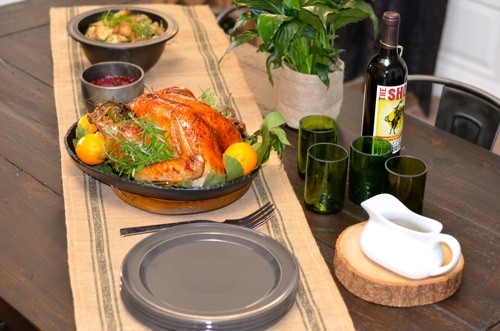 Your turkey is the main event for your Thanksgiving feast. I suggest buying a fresh turkey. Order one in advance so you don’t find yourself with out a turkey the size you want. I’ll never forget the first time I cooked for Thanksgiving for my family in New York City. I didn’t order a turkey in advance and there were no fresh turkeys available. My mother had to strong arm the guy behind the counter to find one in the back to sell us. Lesson learned the hard way! I like to brine my turkey. I find it’s more juicy and tender. I change the favors up year to year. This year it’s the bright taste of citrus using lemons and oranges, mixed with herbs, lacquered with honey and butter. It’s delicious! From by the bay, wishing you wonderful turkey food memories! Prepare brine by combining water, sea salt, honey, sugar, onions, rosemary, thyme, bouquet garni and peppercorns. Cut 2 lemons into wedges, squeezing juice of lemons into the brine along with the wedges. Repeat with oranges and stir to dissolve the salt and sugar. Clean turkey with cold water removing any giblets and or neck. Keep giblets and neck in the refrigerator to use later for gravy base. Place turkey and brine into a resealable plastic bag or into a large non reactive bowl covered with plastic wrap. The turkey should be covered with the brine, if not add more water. Refrigerate over night. The next day remove turkey 40 minutes before planning to place into the oven. Preheat oven to 425 degress F. Remove turkey from brine and pat dry with paper towels inside and out. Season the turkey cavity with salt and pepper. Squeeze lemon and orange juice into the cavity and add the quarters along with rosemary. Tie turkey legs together and place into roasting pan. In a small sauce pan melt butter. orange zest and honey together on a low heat. Use this to baste turkey once before placing into the oven. Roast the turkey at 425 degrees F for 30 minutes then lower the oven to 350 degrees F. For an 18 lb. turkey cooking time will be approximately 3 hours. Use a meat thermometer to check that the meat registers 175 degrees F at its thickest part of the thigh. Baste the turkey about every 30 minutes with the butter and honey mixture. If the turkey browns too quickly tent that part with aluminum foil. When ready, remove from the oven. 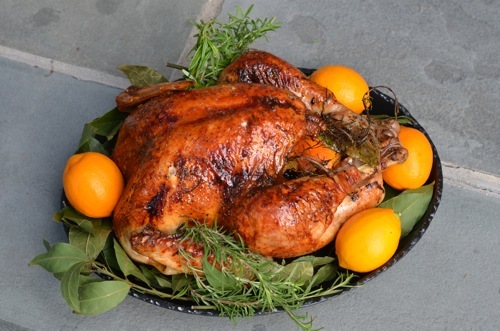 Take turkey from the roasting pan and place on a cutting board to rest before carving, at least 20 minutes. If you are serving later then 20 minutes from removing from oven tent turkey with aluminum foil until ready to serve. This entry was posted in main dish, poultry and tagged brine recipes, citrus, citrus herb roasted turkey, meyer lemons, oranhes, roast turkey recipes, rosemary, Thanksgiving recipes, thyme, turkey recipes on November 17, 2015 by entertainingbythebay.